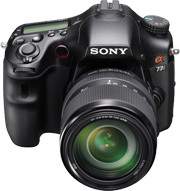 Step up to an incredible shooting experience with the Sony Alpha SLT-A77 Digital SLR camera. Featuring Sony's top-of-the-lineTranslucent Mirror Technology, you can focus and shoot simultaneously for fast, precise performance and continuous shooting of up to 12 frames per second, complete with continuous autofocus. Capture amazingly-detailed images that make for gorgeous enlargements thanks to an impressive 24.3-megapixel sensor. The world's first DSLR to offer a choice of super-smooth 60p, standard 60i or richly cinematic 24p movie modes all at Full HD 1920 x 1080 resolution, you can capture incredible, high quality AVCHD or MP4 videos of all your memorable moments (records in 29-minute segments). A Tru-Finder OLED electronic viewfinder offers remarkable resolution and high contrast for outstanding depth, plus allows you to view setting adjustments in real time for the best possible picture. This outfit includes a solid, all-purpose 18-135mm f/3.5-5.6 zoom lens that's ideal for wide-angle to long telephoto shots, with a newly-developed Direct Manual Focus (DMF) mechanism for smooth and easy focusing, plus a Smooth Autofocus Motor (SAM) which improves AF response when shooting moving subjects. This lens also features a single ED glass lens element and two aspherical lens elements that deliver images with low levels of color aberration for excellent image quality in any setting.